The start of a New Year is a time of resolutions and summaries. For our marketing department, one of the most interesting reports is the one on the condition of mobile applications downloads, time and money spent and future predictions. We are aware of the fact that games rule the world of mobile applications and 2018 was no exception. We would like to summarize last year in terms of mobile apps as our company summary is already live. So let’s take a look at what happened in a mobile world in 2018, based on AppAnnie ‘The State of Mobile 2019’ report. As in previous years, the growth in downloads of mobile apps’ was visible. The general number of downloaded applications exceeded 194 billion which is a 35% increase from 2016. Emerging markets like India or China recorded the highest growths. 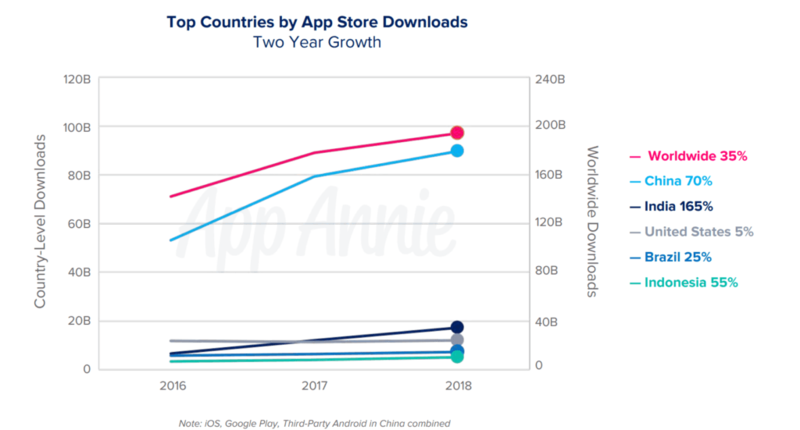 Only for China, the number of application downloads made up nearly 50% of all downloads. Mature markets like the United States have significantly slowed down, going by the number of applications downloaded. We still see a large number of new downloads each year but the growth is much slower than in other countries. On the other hand, mature markets have a much better and stronger user engagement and money spent on applications. AppAnnie ‘The state of mobile 2019’ report include only payments made in applications (paid downloads, in-app purchases, and in-app subscriptions). When we consider that $101 billion earned, excluding payments in apps like Uber, Amazon, and others, this number is even more impressive. Here again, growth is 75% higher than in 2016 and China’s spending makes up nearly 40% of the total consumer’s spent in 2018. We need to remember that users fork out the most money on games. Excluding games, only 26% of the total number is consumer spending. It is still 18% more than 2016. Growth is a little bit slower but definitely noticeable. We can see that looking at our own clients’ realizations like the TopSecret application where more and more users decide to buy their clothes via the app rather than visiting the shop. 5 categories of applications are growing faster than the rest of the market: Video Players and Editors, Entertainment, Photography, Tools, and Finance. When we consider only those categories, the growth from 2016 was 110% compared to 50% of all apps. The highest growth was recorded by Social and Communications apps that gives 50% of the total time spent globally in 2018 in the applications. By the way, if you are interested in the development of a social application read our article about developing custom mobile chat application. 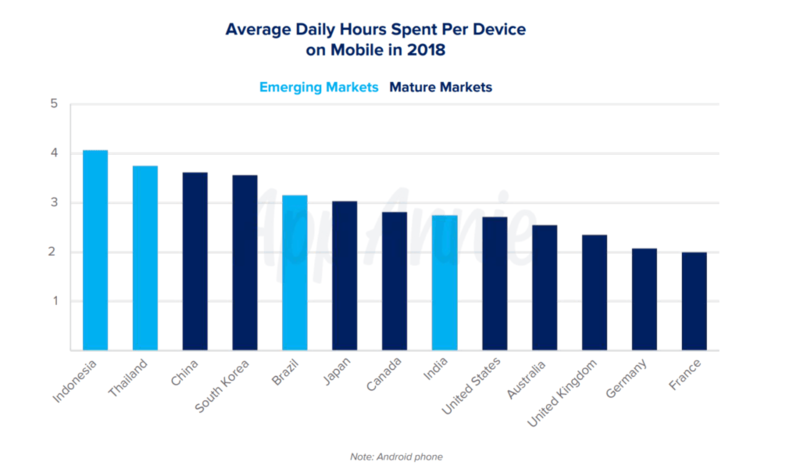 Here, we also see that users from emerging markets spent more time in apps than those from mature markets. For example in Indonesia, the average user spent over 4 hours a day in apps compared to almost 3 hours in Canada and 2 hours in France. What may (or may not) come as a surprise, the highest revenue belongs to mobile-focused companies. In those companies, mobile is the main channel of the product offering – the main point of interaction with the target market – or a secondary presence of high importance. 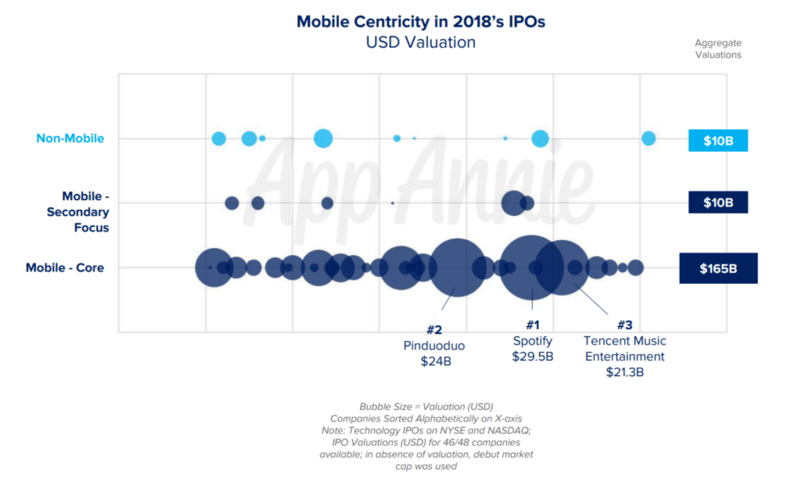 Even for the most successful tech startups of 2018 or companies where mobile is the main focus, the mobile part played a key role in their business. Why is it so effective? Those companies can reach consumers on the device they have with them everywhere they go – their mobile phone. The time of Generation Z is now. People aged 16-24 engage more in non-gaming apps than people aged 25 and more. As per AppAnnie’s report, they spend 20% more time in apps and engage 30% more often than the rest of the population. What may be surprising, games are not the main interest of this generation. People aged 25 and more spend 75% more time a month on games and access them 50% more often than the Gen Z. As already mentioned our involvement in the TopSecret application, it would be worth to highlight some information regarding retail mobile applications. We believe that shopping via applications will grow faster and faster and like with online shopping versus offline shopping will keep gaining users. The predictions say that m-commerce will constitute 75% of total e-commerce transactions by 2021! Globally, over 2 years, sessions in retail apps grew 65%. Again, in the mature market – the US, sessions in mobile shopping grew by 70% over 2 years – 475% in Thailand only. The second most popular way to shop is using peer-to-peer marketplaces. Top 5 include Shopee, eBay, MercadoLibre, letgo and OLX. 5. What about app marketing then? About App Store Optimization – SEO of apps you can read in our app marketing guide. Why should you at least consider ASO actions for your application? Data says that 65% of downloads on the iOS App Store come from organic search. So the higher your app in position, the more downloads it gets. More downloads means more clients and users. The most common form of ASO in 2018 was simply changing the app’s description. Everyone who wanted to sell more during the holiday season just updated the description of their app. Black Friday? Voilà, with well-fitted keywords you were halfway to getting good traffic from organic searches. Would you like to take an action and try ASO activities yourself? Take a look on App Store Optimization article that may be helpful to take your first steps. Do you know the phrase “content is king”? Today, it’s more like “video content is king”. The same goes for the mobile industry. “App is king” – we do not call people anymore (at least it does not work the way it used to), they say that text message marketing is still in use and very effective but the fact is that the mobile apps rule the world. Numbers say everything. You can plan your tasks, share a picture of your breakfast with the whole world and meantime buy some clothes or cosmetics. That’s why people spend so much time using apps. They cover all their needs. The fact is that applications can save your company or help you grow. Both sides – from the client perspective, who can buy from you or just be in touch with you and even from your company’s perspective – an app can make the work of your employees more effective or simply help with internal tasks. Automate them. This topic, however, will be explained in another article. Creates strategies, plans activities, carries out campaigns and creates brand image. Mainly she focuses on e-marketing because is convinced that the Internet and new technologies are the future that happens now. She is open to people and ideas - mixing external output with her own experience, she seeks for ideal solutions. We are going to Start Up 2018 in London!